Among the most-frequently heard complaints by employees, it doesn’t matter how large or small a company is–is that there are too many meetings. That meetings are too long. 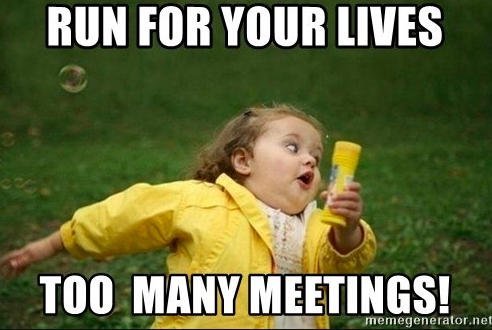 Involve too many people, many of whom spend most of the meeting distracted by texts and emails. That they don’t accomplish anything, or that what they accomplish isn’t cost effective. You want to know how to have fewer meetings? Call your gatherings of employees something other than meetings. Presto! 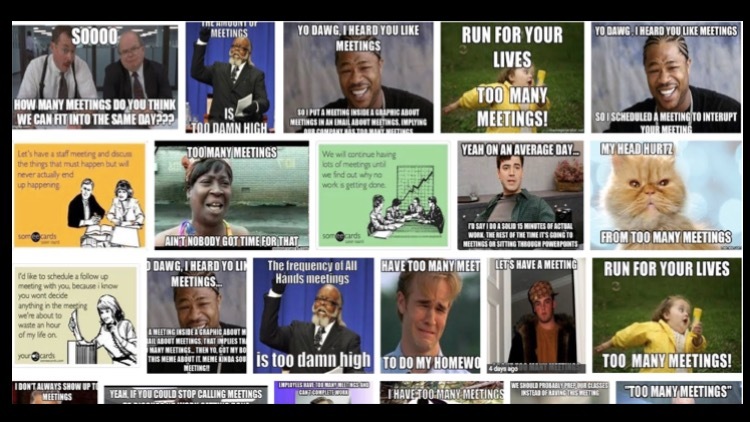 Fewer meetings! It’s not enough to re-name them, though, to make changes that are only cosmetic. For the outcomes of a meeting to change along with its name, its structure and its purpose have to change, too. You don’t have to make this stuff up.The vocabulary is out there. It doesn’t require new language. It takes fresh context for existing language. You have the inventory at your command. Here’s a starter kit of words, with suggestions on how each new name can transform the lumpen concept of ‘meeting,’ and its constipated meaning of ‘too many people with redundant or overlapping roles and unclear areas of responsibility in too-frequent, often-interrupted gatherings that go on too long’ into frames that are more idiosyncratic, specific, purposeful. Whatever you do, do not call a meeting to decide on your new nomenclature. Call it a Naming Bee. A Nomenfest. Anything but the m-word. Don’t be afraid to be whimsical and playful, especially when trying a new form, with a new name. Things will settle into their most useful versions soon enough. Bee – A gathering where something gets made. A quilt. Taffy. A code fix. An investment. Replacements for the m-word. Brainstorm – In common usage for ideation sessions, these gatherings rarely have enough structure. Instead of an invitation to ‘think outside the box,’ work from the understanding that there’s always a box. Then define a new box. Campfire – Our friend, Clint Schaff, uses this name for cross-department meetings at his company. Social idea sharing. Ceremony – A rite of passage or commemoration. Idiosyncratic ritual. Conclave – A grand gathering like what the Roman Catholic Church has done for centuries with the College of Cardinals. Only run by women wearing hats. Convocation – A general assembly, with rituals and structures that include and honor more voices than what has historically been the case. Cookoff – Blind testing and voting on tactics in order to create consensus. Drum Circle – As the renowned improv teacher, Dave Razowsky, says, “Repetition is not redundancy.” This gathering involves repeating and re-stating ideas and problems until new meaning emerges. This technique is also used by actors of the Stella Adler school. Festival – A celebration of one’s industry, community, group or ethos. Add a word to make it idiosyncratic. Forgiveness Festival. Wurst Fest. etc. Fortune Telling – Participants take turns describing tactics/current work. All descriptions must be tied to predictions of lucrative futures and fantastic fortunes for themselves and their company. Gamestorming – Borrowed from the book of the same name by our friends David Gray and Sunni Brown, and James Macanuto, whom we don’t know but must be cool based on the collaborators he keeps. Also borrows concepts from the godmother of modern improv, Viola Spolin, and her book, Improvisation for the Theater. bigSTORY’s ERGO concept can be helpful, too. Play improvised games to communicate and connect with one another, and, ultimately reveal transformative strategies and ideas. Gong Show – Fast pitches of new ideas. Crazy has its day. Use an actual gong. Have an audience. 30 min. time limit. Jam – A gathering of 2-6 people for the purpose of exploring and expressing a theme improvisationally. The role of each participant must mirror the voice and purpose of a musical instrument. Someone keeps the beat like a drummer. Someone lays a foundation like a bass player. A triangle player adds punctuation. Etc. Must be recorded and notated for future reference and iterations. Kickoff – Already in common use, and like Brainstorming, is rarely structured sufficiently. Borrow from sports definitions and rules to add structure. Muster – Borrowed from firefighter competitions. Skills testing and contests with prizes. Parley – A negotiation. The settling of a conflict. Retreat – Off-site truth-telling and strategizing. No technology. No phones. No communication with one’s organization for the duration of the gathering. Seems impossible. Do it. Delegate. You’ll be surprised, and maybe a little scared, by how well things function without you. It’s okay. If things can’t function without you for a few days, you’re not much of a leader to begin with, and ought to question how you play your role. Revival – Participants are asked to affirm or discover their faith in a company, community or group. Or get miraculously healed. Or give money. Preacher or faith healer required. Rodeo – A type of Round Up [see below] structured like a rodeo, with purposeful activities named after rodeo events: Bull riding, calf roping, clowning, trick riding etc. Round Up – Any gathering conducted in a circle with no table or impediments between the participants [see Rodeo, Highlander]. Seance – When I started working Disney, the older employees would ask, “What would Walt do?” The younger ones had a pet response: “Walt’s dead. You missed it.” This concept combines the two. Invoke the memory of a dead founder, ancestor or organizational legacy, determine its current-day relevance, if any, and implement when appropriate. Must include an object that belonged to the deceased. Show – Taken from the entertainment storytelling adage, ‘Show, don’t tell,’ this is a demonstration for an audience of a product or idea. Steve Jobs’ Apple product launches were Shows. If you haven’t already, study them. They required rehearsal. Advance promotion. Timing. The presenter showed instead of telling. He directed his audience’s focus to the design elements of his company’s products–art as an entry point to commerce. Stand-Up – Borrowed from Agile methodology. No one sits. Tight structure. 15 min. limit, etc. Or you can borrow from comedy and make it about laughing gently at oneself, one’s team or organization. No Roasting! That’s too rough a road for most employees. Leave that to the Friars Club. Triage – Crisis management and emergency gatherings. Study ER processes and protocols, adapt them to make them your own. Workout – Combine the physical and the intellectual. Everyone must be doing some form of workout for the duration of the get-together. Yoga poses. Treadmill walking. Crunches. Etc. You can’t eliminate the need for employees to get together in groups, and why would you want to? Such gatherings are the basis of a company’s culture, and provide the human bonding that builds a shared sense of purpose in an enterprise. The robots will be here soon enough, let’s not give them more openings than they already have. The m-word is a machine flag. A robot welcome mat.. What we can do to make work more human, and more purposeful, is to be idiosyncratic and creative with our approach–these are robot weak spots. Exploit their vulnerability by embracing your humanity. How long can you go without using the m-word? What are your ideas for yanking the robot welcome mat from your door?